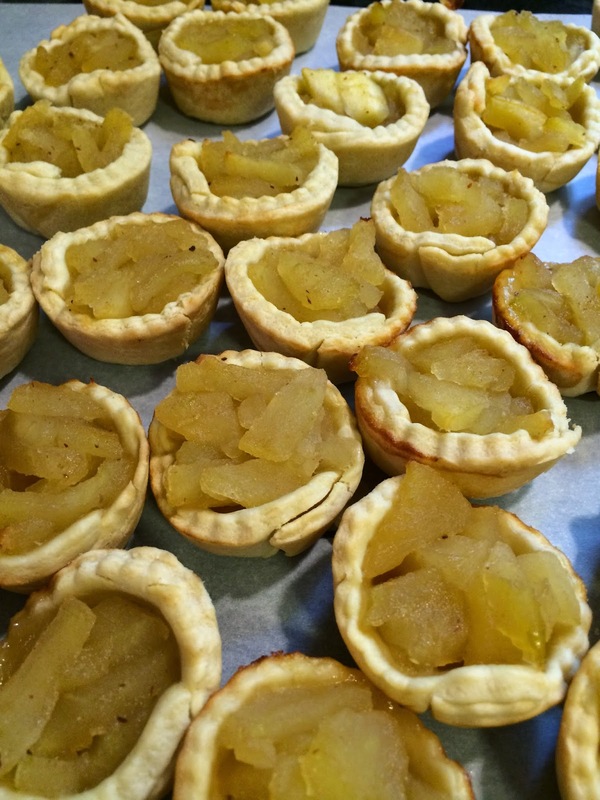 I make these apple tarts for my program called A Taste of Spices. What makes them different is that the apples are cooked in wine (I use a sweet Riesling) and are flavored with ginger and True Ceylon cinnamon (Cinnamomum zeylanicam or Cinnamomum verum). True cinnamon is so called because it was the original form of cinnamon used and was obtained from Ceylon (now Sri Lanka, an island off the southern coast of India). You can find true cinnamon at Hispanic grocery stores sold as canela entera. Most cinnamon Americans use today actually comes from a different source; it is from Cassia, a different species of tree from northern Myanmar, formerly Burma, Indonesia, Vietnam and China. If you've never tried True Cinnamon, you're in for a treat - It's Perfect in this Recipe! Tartes of Apples without covers. A BOOK OF COOKRYE, Very Necessary for all such as delight therin. Gathered by A. W. And now newlye enlarged with the serving in of the Table. With the proper Sauces to each of them convenient. AT LONDON Printed by Edward Allde. 1591. Boyle your Apples very tender in a little wine, or for lack of Wine Ale, and then strain them with Sugar, sinamon and ginger. Make a tart of it without a cover. Peel, core and slice the apples. Place them in a saucepan with the wine. Cook over a low heat until the apples are soft and the wine is reduced to a sticky syrup. Add the sugar and spices. Line your pie dish with the pastry of your choice. Pour the apple mixture into the pastry. Bake in an oven preheated to 375° F for about 35-40 minutes. Cool slightly and serve warm. You can serve this with whipped cream. Based on: To make short paste for tarte. A Proper Newe Booke of Cookerye, published in 1545. Take fine floure and a cursey of fayre water and a dysche of swete butter and a lyttel saffron, and the yolckes of two egges and make it thynne and as tender as ye maye. Mix together flour and salt in a mixing bowl. Add the butter and work the butter into the flour using your hands so that the butter is no larger than the size of peas. Add the egg yolk and stir with a spoon. Then add enough water to make dough come together in a ball of soft dough. Refrigerate at least 30 minutes before using. When ready to use, roll out on a well-floured board. Makes enough for one standard-sized thinly rolled covered pie (bottom and top). It's always annoyed me that cassia can be passed of as cinnamon. They are different. I bought some cinnamon (or so I thought) from a well known British firm only to discover it said cassia in very small print on the box. It's not that I don't like cassia, but I do want to know what I'm buying. Most people do not even know there are different types of cinnamon so spice dealers probably don't feel the need from the public to label their products more clearly. I guess if you want the real thing you need to read the fine print before you buy!